This lovely subtle t15 small island with granite top gives you loads of extra storage space in the deep drawers and very deep cupboards, and of course loads more worktop space too. 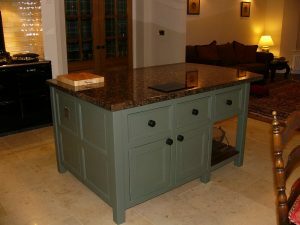 This island has open shelving to one end on which to display large baskets, pans or stack bottles of wine onto with cupboards at the far end, we can even add power points for those all important kitchen gadgets. The unit here has been painted in farrow and ball’s ‘lichen’, and finished with ebonised knobs on the doors and drawers. The worktop used on this island is granite, unfortunatly we can only provide granite worktops in our very local area of wetherby, we have priced this unit with a 27mm pine worktop but if you would like to use granite from your local supplier we will suply the unit minus a worktop at a discounted price for you-please just ask. Height 915mm, width 1100mm, depth 1650mm. With our favourites feature you can build your Kitchen as you brows the site. To use this feature just click the stars next to the items you like. Once you have selected all your favorites you can review them; then you are able to send your selection to us, to get a no obligations quote, for the kitchen of your dreams. If you have something in particular in mind or just want a question answering why not give us a call or fill out the form below. Just to say thankyou for supplying such a brilliant kitchen and to deadline too! You made ordering online run so smoothly it felt like you were only down the road even though you were in another country! It really was an amazingly hassle free way of getting a bespoke kitchen and it was incredibly good value too! You did exactly what you said you would within a short timescale an your attention to detail was second to none. Search for an individual item using this search box.